In the top menu, you will find all the necessary commands for loading and previewing image sequences. 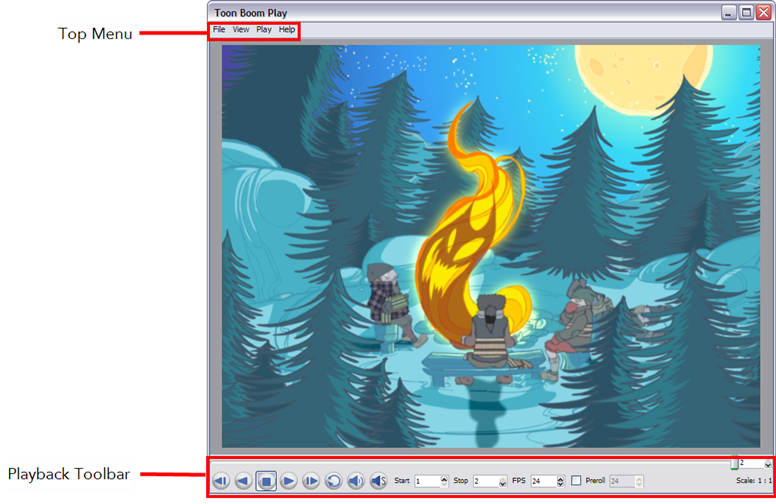 For more details about the commands found in these menus, refer to Toon Boom Play Commands. Use the Playback toolbar (located at the bottom of the player interface) to play your animation, loop your playback, navigate through your frames and change the playback speed. Click on this to go back to the first loaded frame of the animation. You can also do this from the top menu by selecting Play > First Frame. Click on this to play the scene in reverse. It will start from the current frame and move in backwards to the first frame. Or select Play > Play Scene Backward from the top menu. Click on this to play the animation. Or select Play > Play Scene Forward from the top menu. Click on this to go to the last loaded frame of the animation. Or select Play > Last Frame. from the top menu. Click on this to repeat your playback indefinitely. Or select Play > Loop from the top menu. Enter values in these fields to change the playback frame range. Enter a new value (in frames per second) in this field to change the playback speed. Move this slider left or right to scroll backwards or forwards through the playback frames. Click in the check box to enable the Preroll option and then enter the number of blank frames in the Preroll field. These frames will be added at the start of the playback. This indicates the ratio of the playback size you are currently viewing compared to the image Toon Boom Playe’s actual size. Click on this to enable sound in the playback. Or select Play > Enable Sound from the top menu. Click on this to enable sound scrubbing in the playback or select Play > Enable Sound Scrubbing from the top menu.